With the phenomenal success of Rovio Entertainment's run away app, Angry Birds, comes spin off movie (creatively titled) The Angry Birds Movie....and as we all know, what's the best way to celebrate the release of a super cool animated movie? That's it, by bringing us lots of even cooler dolls and toys of the movie characters. The Angry Birds Movie has some uber cute dolls and toys too, that you'll be dying to add into your world. So why do we need a film? Well, why not? We learn more about why the birds are so angry, and what's making them wan to attack the green pigs so much. The animations in the app are adorably cute, so this movie will undoubtably brings us more cuteness in absolute abundance. If you're a fan, and can't wait to get your hands on the Angry Birds Movie dolls and toys, then you're in the right place. The movie has been a massive hit in box office, and undoubtably in the hearts of fans alike. Whether or not you came to the movie from your love of the Rovio app, or if you just fancied the latest animation, you'll be pleased you checked it out. So, why not check out the beautiful toys that sit alongside the movie so well. If you can't wait much longer and have to choose your Angry Birds Movie dolls and toys right now, then head over to Amazon.com and take a look. If you're not in the United States of America, worry not, as you can check out what Amazon.co.uk have to offer in the of fabulous the Angry Birds Movie dolls, toys and merch, right here, now! If you're a fan of the Angry Birds Movie, and love Red, you are going to LOVE this. 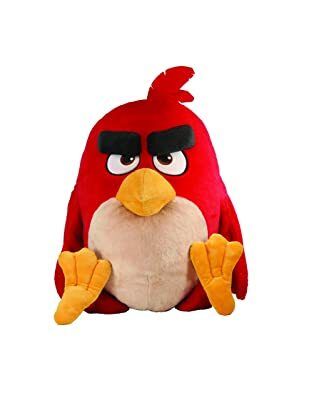 Now, you can reenact your very own angry bird scene...this plush doll is HUGE, weighing it at a cool 22" - that's pretty impressive right? Almost the size of a small child! But that's not all, the fun does not stop there! Get this...he talks! Yep, so you can snuggle into this cushion like Angry Birds Movie doll and be sent into a lullaby with the dulcet tones of Red himself. What's not to love? 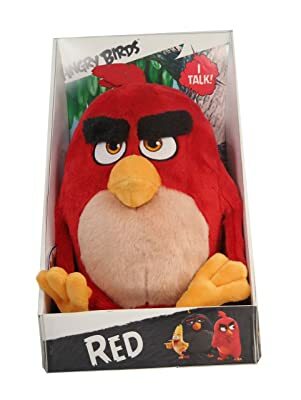 The Angry Birds Movie Plush Red, 11"
If the previous version of the plush doll of Red from The Angry Bird Movie was too big, then this one might be just right. A tad smaller, but no less amount of enjoyment can be had from it. What's more...as the picture rightly says...it talks* This Red doll features phrases from the movie itself. Including the hilarious catchphrase that we'll all be saying sooner or later... "Drop your nuts and get off your butts". You'll also be pleased to hear, if you like this plush doll, there are also others from the movie to collect. Why not get the whole set, and recreate an Angry Birds montage in your front room, straight outta the app game itself. Glorious! *Please note, some versions of the UK version of this Angry Birds Movie Red doll, might vary, in size and talking function. Please check before purchase. Have you seen the Angry Bird Movie Trailer? You might be confused, and wondering how the makers of the Angry Birds Movie can possibly turn an app into a fully fledged, realised animated movie...well, by checking out this sample here, it looks like a pretty cool idea. whet your Angry Birds Movie appetite right here, now! Angry Birds Movie Mini Figure Toys! If you're after some mini figures from the Angry Birds Movie, well then, you are in the right spot exactly. 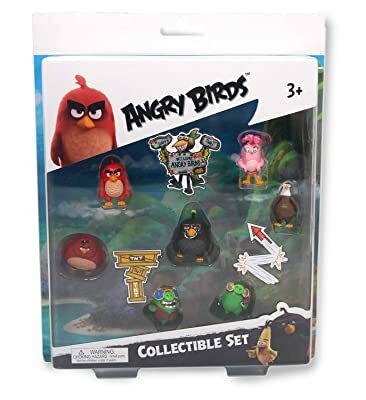 The collectible set features 7 characters from the Angry Birds Movie - so you can either play with them, or simple give them pride of place on your special shelf. There are a few sets to collect, so if you don't like the look of this one, you can try Set B here! 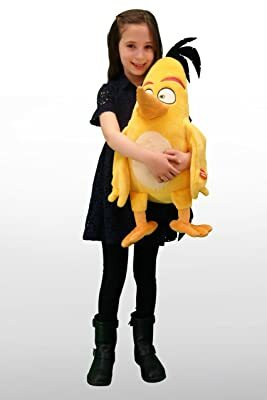 If you love yellow, plush toys, cushions or big things to cuddle...then hands down, this is the perfect Angry Birds Movie doll for you! Perhaps you have a small person in your life who likes to nap on a big spongy cushion...oh, and who happens to me a massive fan of awesome animations...then this is THE doll for them! If you're not sure what exactly is meant by "giant" doll, check out the picture to the left here...this Angry Birds Movie Chuck doll is a piece! Massive! But wouldn't he look amazing perched upon your sofa, or on someone's bed to look after the place before story time? In all he measures approx 28" inches - but who's counting?